In a previous post, I wrote that I had been spending about a third of my free time writing an iPhone app. Actually, I’ve been a little obsessed by it. Most of my evening time after the kids go to sleep has been sunk into the depth of Objective C and iPhone. I’m happy to report that it is now ready for beta testing. 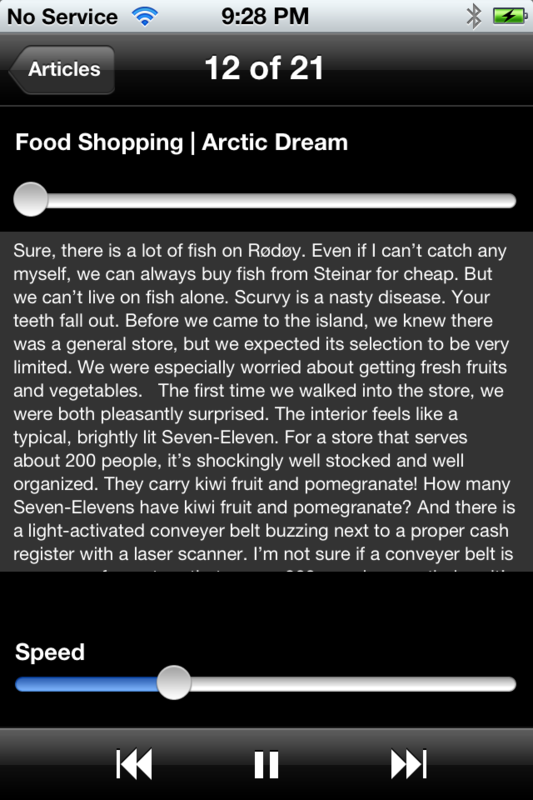 The app uses speech synthesis, or text-to-speech, to read articles for you. It’s best for commuters who spend a lot of time in their cars (an interesting target customer-base considering where I am), who wish to read long articles that you never find the time to read. I suspect this kind of app is best for people who don’t want to just listen to the news — you have the radio for that. But if you’re a professional who need to read trade articles, this is a good option. Text-to-speech works with pretty much any language: English, Norwegian, French, etc.. It can even speak English with an American and British accent. The quality is obviously not as good as a human being reading it, but it’s easily understandable. The American English voice is the best. If you fit in the target audience (people who want to listen to long articles on long commutes), and this is something you would use regularly, please email me at winstonschen@gmail.com, and I’ll send you instructions toward the end of the week. You’ll need an iPhone 4 or 4S running iOS 5. It’s not on the app store — you’ll have to install it yourself using iTunes. Yes, if the iPad is running iOS 5. Let me know.